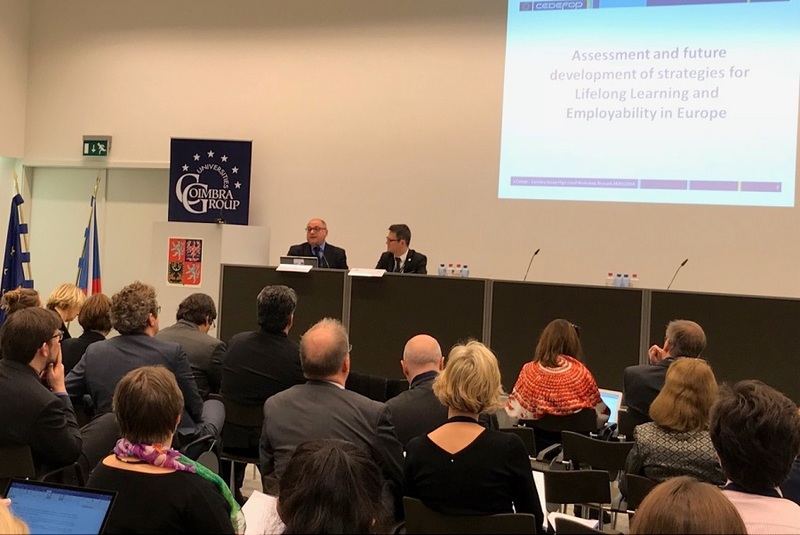 Cedefop Director James Calleja spoke about the developments in higher education and vocational education and training (VET) at European level at the first Coimbra Group high-level workshop on lifelong learning and employability in Brussels on 24 January. The workshop discussed a need to bring high-prestige universities closer to the world of employment. The Coimbra Group is a European network made up of 39 comprehensive, long-established research universities from across Europe including the universities of Salamanca, Padova, Pavia, Groningen, Jagiellonian, Aarhus, Charles University Prague, Leuven, the University of Poitiers, Granada, Durham, University College London and Vilnius. Mr Calleja said that the Bologna and Copenhagen processes have been catalysts for change and innovation across all European systems of education. The focus on quality, credit, mobility and qualifications based on learning outcomes has made learning a means of social advancement in the path towards excellence. Universities and vocational colleges have different but complementary missions. While research is predominantly linked to university education, applied research and work-based learning are associated with VET. Both sets of skills are interchangeable, with more universities moving towards applied research and work experience and more vocational colleges regarding research as part of their mission to transform knowledge into skills and competences. In a labour market largely dominated by technology and automation, skill democratisation will inevitably rise and unify forms of learning across institutional cultures. Mr Calleja highlighted the excellent reputation of European universities and the added value vocational colleges provide in transferring knowledge to the labour market. Chair of the Coimbra Group Executive Board Ludovic Thilly (University of Poitiers) spoke about this new initiative as a step towards closer collaboration between universities of high repute, university colleges and universities of applied sciences. The Cedefop Director also intervened in the concluding panel discussion on learning, strategies and future actions, together with the speakers of the first session and representatives of the Coimbra Group working groups.